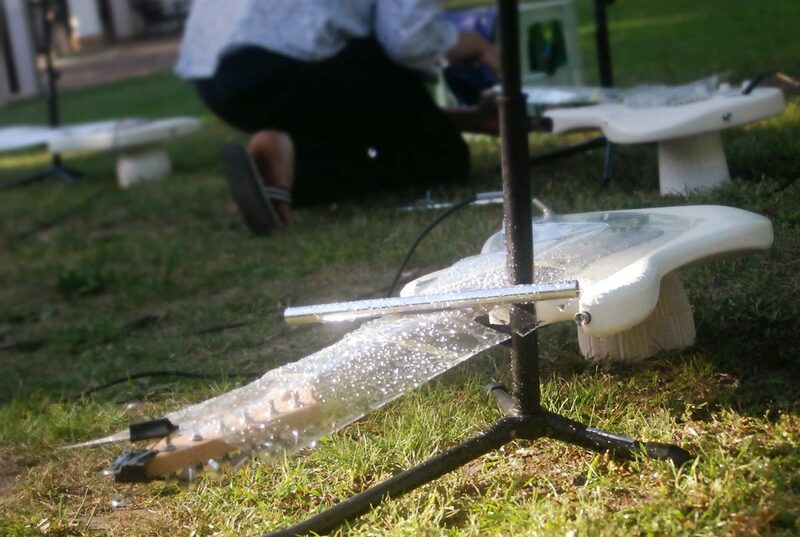 Oscillations is an Installation for multiple Guitars, a Pendulum and an optional Musician. A motorized Pendulum creates generative Music by circulating over guitars and bringing them to sound. A pendulum attached to a string is set in motion by a rotary motor installed on the ceiling of a room. The pendulum swings over the guitars positioned under the pendulum – causing their strings to vibrate by contact. The pendulum oscillates over the guitars, randomly hitting their strings, pickups or bodies. The resulting music oscillates inside the room. A drony, scapy, yet even sometimes percussive Music evolves. Overtones and long-lasting Resonances are to be heard. For Huey Walker, there is something resounding in every sound. A passing freight train has a tonality as well as the fan sound of a computer. Nature also sings its songs – sometimes freely improvised, sometimes following a biological or temporal order. Huey Walker plays his instruments and music in a system of intuition, minimalism, aleatoric and monotony. The installation „Oscillations“ pays tribute to all these things. The resulting music is a mechanically generative music, without computer-aided calculations, without algorithm but with circular motion, diverted by natural imperfections in kinetic movements. 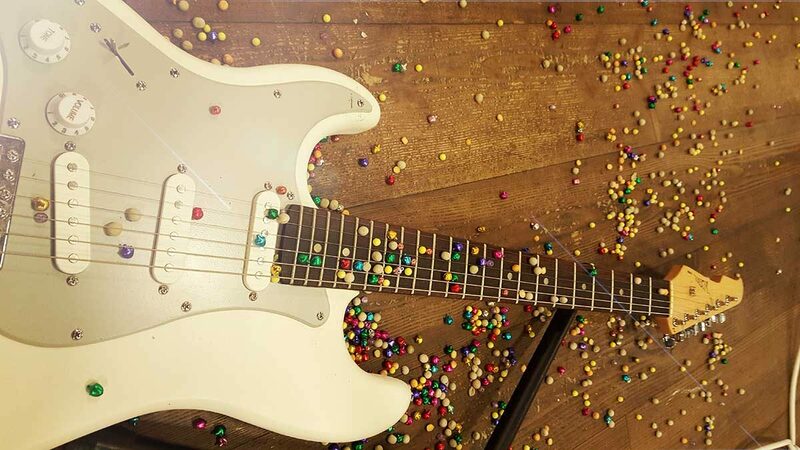 Variations in dynamics, tonality, volume and richness of sound are due to the pendulums stirrings and whirrings and its directional and rhythmical changes caused by its mechanic interactions and impacts with the guitars. The installation was shown for the first time in the context of the Kulturnacht in Greifswald at the art space Alte Bäckerei in 2016. 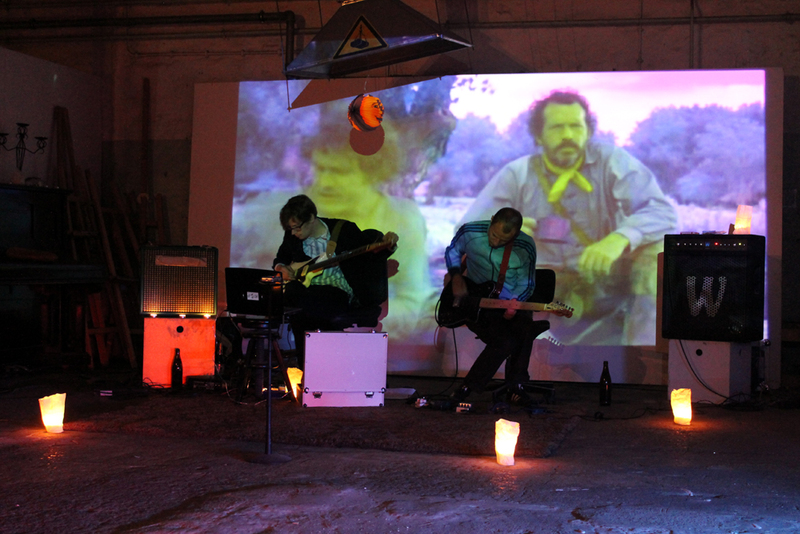 As part of a finissage, Huey Walker played a collaborative concert with his installation. A CD with recordings made purely by the Installation was released on „Nouvelle Walk“, a sub-label of „Rakkoon Recordings“. Paul Sauerland and Lucas Treise made a short documentary film about Oscillations.